Vaccinations are important. On Jan. 16 health officials in Denver alerted the public of a measles exposure in Colorado. Denver Public Health officials believe the person was traveling internationally when they were exposed to measles. Measles, or rubeola, is a viral infection of the respiratory system. It is a very contagious disease that can spread through contact with infected mucus and saliva. An infected person can release the infection into the air when they cough or sneeze. The virus can live on surfaces for several hours. As the infected particles enter the air and settle on surfaces, anyone within close proximity can become infected. Who is at risk of getting the measles? 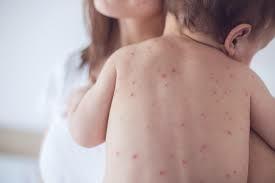 Measles is highly contagious and can be very dangerous for infants, people with weakened immune systems, and those who have not been vaccinated. It’s spread through those common winter companions, sneezing and coughing. What to do if you believe you have been exposed. If you have symptoms or believe you have had exposure to someone with the measles, please call us to confirm next steps and how we help.